At the conclusion of the 5K in 2016 the Park District determined changes needed to be made to the race. The goal was to have a family event for the residents of Franklin Park. We wanted to encourage families to reach their fitness goals. At the start of 2017 we reached out to School District 84 to create a partnership. Working with the PE teachers we determined we were missing an opportunity for the grade school children in the community. As a group we discovered a missing element to our race. We determined we need a stepping stone to help the younger runners achieve their fitness goals, a 3K. 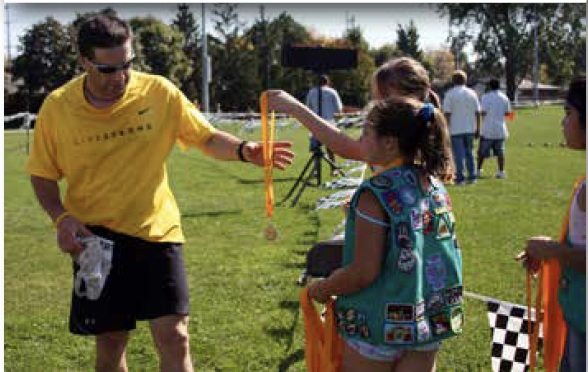 Children can build on their accomplishments each year beginning with the mile and working their way up to the 5K. This develops a future for runners in Franklin Park and a future in the Community Fun Run, achieving your fitness goals year after year. This year families have the opportunity to register for the 5K, 3K or Mile race. Depending on their ability and their goals they have a choice between the three. The 5K will begin promptly at 9am and they will follow the race course through the neighborhood streets around North Park. Immediately following the 3K will kick off on the same course and end at the same finish area but will take a shorter path. The course is a mini version of the 5K. Then we will conclude at North Park with our Mile where our youngsters will make their way around the walking path as the finishers of the 5K and 3K cheer them on. Proceeds for the 5K support the Parks Foundation of Franklin Park. The Parks Foundation is a non-profit organization that works towards expanding recreation opportunities for those who cannot afford it. By supporting the Community Fun Run, you can directly give back to the residents of Franklin Park. Recreation programming is essential to a child’s development and the Foundation gives children a chance to participate in such programs.